Aluminum Housing Provides Rapid Heat Transfer Between the Sensor and Mounting Surface for Accurate Measurements. Housing Includes a Clearance Hole for a #4 Mounting Screw or Can be Cemented or Epoxied to Flat Surfaces. Standard Accuracy is ±0.2°C from 0 to 70°C, Optional Accuracy of ±0.1°C from 0 to 70°C is Available. 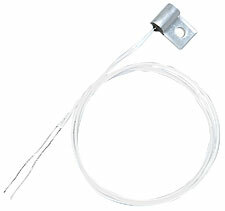 Available with 12" (305mm) long PFA Insulated Wires or 40" (1 meter) Long PFA Insulated and Jacketed Cables. This surface sensor is designed for a variety of temperature measurement applications. It represents a low-cost, fast response sensor and lends itself to easy mounting on flat surfaces. 2252 Ohms at 25°C, ±0.2°C Interchangeability, 12" (305mm) Long Leads. 3000 Ohms at 25°C, ±0.2°C Interchangeability, 12" (305mm) Long Leads. 5000 Ohms at 25°C, ±0.2°C Interchangeability, 12" (305mm) Long Leads. 10,000 Ohms at 25°C, ±0.2°C Interchangeability, 12" (305mm) Long Leads. 30,000 Ohms at 25°C, ±0.2°C Interchangeability, 12" (305mm) Long Leads. Nota: For additional cable length add required length (in inches) to the end of the Model number and add $0.80/ft to the price. For a phone plug connector, add " -PP" to the Model Number and $7 to the price.